I learned how to make a date bar recipe years ago; it is a favorite of many members of my family. As a child I remember (as do my other siblings) traveling to Cincinnati with Mom and Dad. We would always stop in at the bakery which was owned by two brothers who were very close to our family. I don’t remember if they were relatives or just close friends. I do remember my brothers would call each of them “Brother”. My clearest memories are about the date bars which were in their bakery cases. The fragrance of them baking overwhelmed anything else in the shop. They always had so many of them because everyone loved them and came in to buy some. We got samples while we were there but they always sent more home with us. I include some bar cookie recipes on my list of Christmas cookie recipes because they taste so good. Besides they are so easy to make and very fast to bake. 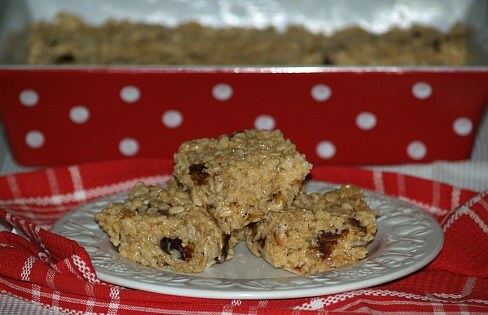 Those who like oatmeal bar recipes will like these because it has a lot of rolled oats in them. What a delicious combinations! These taste just like the ones I had from the bakery when I was young. Grease a 9x13 inch baking pan. Chop 3 cups of dates and place in a saucepan. Add ¼ cup of white sugar and 1 ½ cups water. Cook over low heat stirring constantly until thickened. I usually have to add a little more water as it cooks to keep it at a spreading consistency. Cool. Mix the butter and brown sugar together thoroughly. Add in the flour, salt and soda and blend altogether. Mix in the oats. Press half of the mixture into the prepared pan. Spread with the date filling. Then top with the remaining oat mixture and pat down lightly. Bake 25 to 30 minutes or until lightly browned. Cool to warm and cut into bars. I learned how to make a date bar recipe that can be modified using many other ingredients which give added flavor. This one has the additional flavors of peanut butter, coconut and cinnamon making it delicious. This breakfast bar recipe or granola bar recipe will make a quick breakfast when in a hurry. Cream butter, sugar, egg and vanilla in a large bowl. Combine flour, baking soda, salt and cinnamon; add to creamed mixture alternating with milk. Stir in cereal, raisins, coconut and peanut butter chips; spread evenly in a foil lined jelly roll pan. Bake for 20 to 25 minutes; cool completely and invert pan. Peel off foil and cut into bars. Although this granola bar recipe, a date bar recipe is fat free it is delicious with the addition of melted marshmallows. Melt margarine and marshmallows in a large Dutch oven over low heat, stirring constantly. 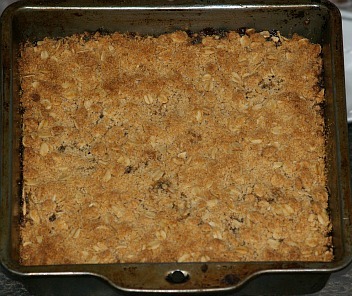 After marshmallows have melted remove from heat; add granola, dates and Rice Krispies; mix well. Using a fat free spray, lightly coat a 9 X 13 inch dish or pan; press mixture firmly down with palms of hands. Cool and cut into bars.